(1 Customer Reviews) | Write Review 52 issues per year Every Monday, League Express brings you the best news, match reports and pictures from around the world of Rugby League including comprehensive coverage of every game in the Betfred Super League, Championship and League 1, plus the Australian NRL. We also bring you the latest news from your local club and the international game, plus in-depth coverage of the grassroots game. Columnists include editor Martyn Sadler, former Great Britain star and Golden Boot winner Garry Schofield, and Daily Mirror Rugby League correspondent Gareth Walker’s regular Championship View. Our lively Mailbag contains a wide selection of views from readers on all aspects of the game, while League Talk focuses on the lighter side of Rugby League as well as carrying details of the latest club events and fundraisers taking place. It’s an unbeatable package for any Rugby League supporter. The end of 2018 is upon us – and what a year it has been. There have been highs, there have been lows and they has been some outright crazy ongoings. One thing is for certain, 2018 won’t be forgotten for a while. 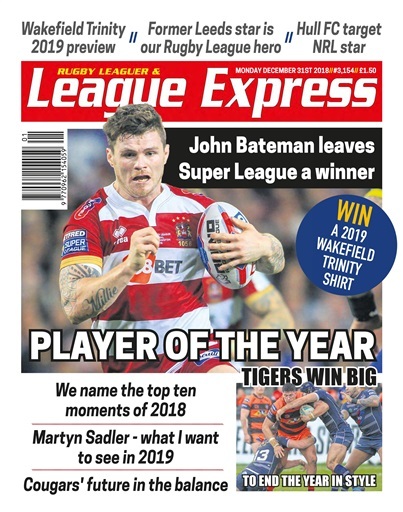 But while everyone gets ready to welcome in 2019, we’ve found the time to squeeze out one last edition of League Express this year. 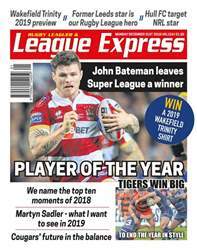 We reveal the results of our 2018 Readers’ Poll and we reveal which player is the League Express Player of the Year, as well as our Young Player and several other categories. We arrive at the culmination of our Top 50 Significant Moments of the Year series. Our editor Martyn Sadler reveals what he’d like to see in Rugby League in 2019. Garry Schofield gives us his view on how clubs will perform in League 1 in 2019. We reveal the latest on Warrington Wolves’ pursuit of Gareth Widdop. New year, new rules? It’s time to prepare yourselves for some major Super League changes. A significant update on the future of Keighley Cougars. We reveal which NRL centre Hull FC have on their radar. James Donaldson provides an update on his future… and how it could be at Leeds. Chris Chester has apologised to two of his players. But why? We’re out in stores as usual on Monday, but if you’re busy preparing for your New Year’s Eve festivities, why not buy online? You can get the paper on your smart device by simply going to totalrl.com/le. Every Monday, League Express brings you the best news, match reports and pictures from around the world of Rugby League including comprehensive coverage of every game in the Betfred Super League, Championship and League 1, plus the Australian NRL. You'll receive 52 issues during a 1 year League Express magazine subscription. The format may have changed but the enthusiasm for the game of rugby league and the concise info has not !!! You'll receive 52 issues during a 1 year League Express magazine print subscription.